In this tutorial we will build an amazon scraper for extracting product details and pricing. We will build this simple web scraper using python and LXML and run it in a console. But before we start, let’s look at what can you use it for. What can you use an Amazon Scraper for ? Monitor products for change in Price, Stock Count/Availability, Rating, etc. By using a web scraper, you can update your data feeds on a timely basis to monitor any product changes. These data feeds can help you form pricing strategies by looking your competition – other sellers or brands. If you’re a retailer, you can monitor your competitor’s products and see how well they do in the market and make adjustments to reprice and sell your products. You could also use it to monitor your distribution channel to identify how your products are sold on Amazon by sellers, and if it is causing you any harm. Reviews offer abundant amounts of information. If you’re targeting an established set of sellers who have been selling reasonable volumes, you can extract the reviews of their products to find what you should avoid and what you could quickly improve on while trying to sell similar products on Amazon. What data are we extracting from Amazon? We’ll build a scraper in Python that can go to any Amazon product page using an ASIN – a unique ID Amazon uses to keep track of products in its database. First, let’s identify a product ASIN. 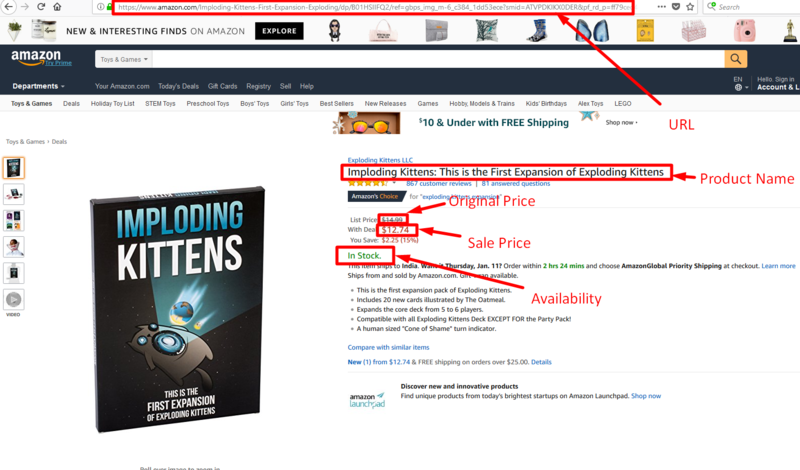 For example, in this product – Imploding Kittens ( https://www.amazon.com/Imploding-Kittens-First-Expansion-Exploding/dp/B01HSIIFQ2/ ), the ASIN is B01HSIIFQ2. Gather the ASINs for the products you need data from. The next step is to build a script that goes to each one of those product pages, downloads its HTML and extracts the fields you need- e.g., Product Title, Price, Description, etc. XPaths are used to tell the script where each field we need is present in the HTML. XPaths are one of the few ways in which you can select some content from a big blob of XML or HTML (properly structured HTML is similarly structured as an XML document) content. An XPath tells you the location of an element, just like a catalog card does for books. We’ll find XPaths for each of the fields we need and put that into our scraper. Once we extract this information, we’ll save it into a JSON file. Since we already have the list of products, let’s get started. Python Requests available here ( http://docs.python-requests.org/en/master/user/install/). Requests allow you to send HTTP requests. You won’t need to add query strings to your URLs manually. It’s an easy-to-use library with a lot of features ranging from passing parameters in URLs to sending custom headers and SSL Verification. If the embed above doesn’t work, you can download the code directly from here. Modify the code shown below with a list of your own ASINs. #Change the list below with the ASINs you want to track. #Save the collected data into a json file. Assuming the script is named amazon_scraper.py. Type in the script name in command prompt or terminal like this. This will create a JSON output file called data.json with the data collected for the list of ASINs present in the AsinList. "AVAILABILITY": "Only 1 left in stock." "AVAILABILITY": "Only 2 left in stock." You can also extract reviews from product pages. Head over to this new blog post to learn how. We are adding this extra section to talk about some methods you could use to not get blocked while scraping Amazon. Amazon is very like to flag you as a “BOT” if you start scraping hundreds of pages using the code above. The easy answer is to NOT get flagged as BOT. Okay, how do we do that ? Mimic human behavior as much as possible. While we cannot guarantee that you will not be blocked, we can share some tips and tricks to not get banned by Amazon. If you look at the code above, you will a line where we had set User-Agent String for the request we are making. Just like proxies, it always good to have a pool of User Agent Strings . Just make sure are using user-agent strings of the latest and popular browsers and rotate the strings for each request you make to Amazon. You can learn more about rotating user agent string in python here. It is also a good idea to create a combination of (User-Agent, Ip Address) , so that it looks more human than bot. You can try slowing down the scrape a bit, to give Amazon fewer chances of flagging you as a bot. You don’t have to be too slow. But about 5 requests per IP per minute isn’t much throttling. If you need to go faster, add more proxies. You can modify the speed by increasing or decreasing the delay in the sleep function of line 18 of the code above. When you are blocked by Amazon, make sure you retry that request. If you look at the code block above we have added 20 retries. Our code retries immediately after the scrape fails, you could do an even better job here by creating a retry queue using a list, and retry them after all the other products are scraped from Amazon. Due to popular demand, we have added an easy to use API in Mashape to get product details from Amazon.com real time, by passing the ASIN as a GET parameter. You can use our free trial for relatively small workloads of up to 10 API calls per day. "Amazon Best Sellers Rank": ""
When you’re crawling a massive site like Amazon.com, you need to spend some time to figure out how to run your entire crawl smoothly. Choose an open-source framework for building your scraper, like Scrapy or PySpider which are both based in Python. These frameworks have pretty active communities and can take care of handling a lot of the errors that happen while scraping without disturbing the entire scraper. Most of them also let you use multiple threads to speed up scraping – if you are using a single computer. Scrapy can be deployed to your own servers using ScrapyD. There is a limit to the number of pages you can scrape when using a single computer. If you are going to scrape Amazon on a large scale (millions of product pages a day), you need a lot of servers to get the data within a reasonable time. You could consider hosting your scraper in the cloud and use a scalable Version of the Framework – like Scrapy Redis. For a broader crawl, you can use a message broker like Redis, Rabbit MQ, Kafka, etc., so that you can run multiple spider instances to speed up the crawl. If you are using a scraper to get updated prices or stock counts of products, you need to update your data frequently to keep track of the changes. If you are using the script in this tutorial, use CRON (in UNIX) or Task Scheduler in Windows to schedule it. If you are using Scrapy, scrapyd+cron can help schedule your spiders so you can refresh the data promptly. If you are scraping a large number of products from Amazon, writing data to a file would soon become inconvenient. Retrieving data becomes tough, and you might even end up getting gibberish inside the file when multiple processes write to a single file. Using a database is recommended even if you are scraping from a single computer. MySQL will be just fine for moderate workloads, and you can use simple analytics on the scraped data tools like Tableau, PowerBI or Metabase by connecting them to your database. For larger write loads you can look into some of the NoSQL databases like MongoDB, Cassandra etc. Amazon has a lot of anti-scraping measures. If you are throttling amazon, you’ll be blocked in no time and you’ll start seeing captchas instead of product pages. To prevent that to a certain extent, while going through each Amazon product page, it’s better to change your headers by replacing your UserAgent value to make requests look like they’re coming from a browser and not a script. If you’re going to crawl Amazon at a very large scale, use Proxies and IP Rotation to reduce the number of captchas you get. You can learn more techniques to prevent getting blocked by Amazon and other sites here – How to prevent getting blacklisted while scraping. You can also use python to solve some basic captchas using an OCR called Tesseract. Scraped data is always messy. An XPath that works for a page might not work for another variation of the same page on the same site. Amazon has LOTS of product page layouts. If you spend an hour writing some basic sanity check for your data – like verifying if the price is a decimal, a title a string less than say 250 characters, etc., you’ll know when your scraper breaks and you’ll also be able to minimize its impact. This is a must if you feed the scraped amazon data feeds into some price optimization program. Read More: Scalable do-it-yourself scraping – How to build and run scrapers on a large scale. We hope this tutorial gave you a better idea on how to scrape Amazon or similar e-commerce websites. As a company, we understand e-commerce data having worked with it before. If you are interested in professional help with scraping complex websites, let us know, and we will be glad to help. Need some help with scraping eCommerce data? SyntaxError: Missing parentheses in call to ‘print’. Did you mean print(print e)? You are trying to run a python 2 script using python 3. Try running this script using Python 2 and it should work. Thanks a lot for the tutorial. Is there any way to save the same output to a .CSV file instead of JSON? Is someone who has success prime scrape in amazon? please!! advise me, if there are any successful people who scrape whether you are prime of additional items classified by size & color. my head will be crushed. Amazon URL responding slow, who can I make it fast? Is there a way I can import my ASINs from an Excel file and export the prices and findings to another Excel file? Sure anything is possible through programming however not in the scope of this article. Libraries that manipulate excel or excel macros can help you do that easily. https://scrapehero-amazon-product-info-v1.p.mashape.com/product-details?asin=B01HSIIFQ2 this URL is not working. Please go to https://www.scrapehero.com/amazon-api-subscription/ to use the API. APIs are language agnostic so it will work with PHP too.